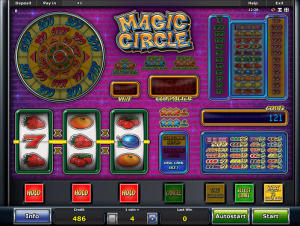 Magic Circle is yet another classic slot machine-style online slot from the developers at Novomatic! It has a base game and a club game as well as a bonus game! The RTP for Magic Circle is 95.01%. The RTP of a slot represents the percentage of all bets (that are made on the slot) that are returned to players. An RTP is calculated over an extended period of time and covers bets made from all players. The actual percentage each player will get each time they play will vary greatly – some players might lose but other players will win hundreds of times their bet! You never know which way the reels are going to spin but that’s part of the allure of slot games. Players get a kick out of the excitement of not knowing! When choosing a slot game, you’ll want to pick one with the highest RTP. Most Novomatic slot games have RTPs between 94 and 96%. Don’t be swayed by higher RTPs from other developers! Novomatic games really pay out and any player can win. With slot games from other vendors, you really have to trigger a special feature to win anything. That’s why Novomatic fans stick to Novomatic. They know they can rely on them to make a really great slot – and Magic Circle is no exception! There are fruit symbols galore in this game, as well as flashing lights, funky sounds and mystery wins! Play Magic Circle here for free! We know the best casinos where you can play Magic Circle online for real money. Go to our review section and choose your new Novomatic Casino. The base game in Magic Circle is played on 3 reels with 1 payline. The payline runs horizontally across the middle positions of the reels from left to the right. To play the base game, you need to bet 1 coin per spin. You can set the value of the coins at the bottom of the screen – the minimum possible coin value is 0.01 and the maximum possible coin value is 5.00. When you play the base game, you need to match a minimum of 2 symbols on the payline (matches must be adjacent and start from reel 1 on the left). The symbols are: cherries, lemons, oranges, plums, strawberries, four-leaf clovers, grapes, watermelons, red sevens, bells and bars. Some of the symbols have a blue or a red star on them, too. If you spin three of these (with matching colour stars) anywhere on the reels (not just on the payline), you will be awarded a mystery win! The wins from the base game can either be added to your balance or to the club meter. An extra feature that the base game has is holding reels. You can hold up to two reels for a second spin! The Club Game is played on the same reels except it is played with 27 win lines instead of just one! You can only play the club game if you have enough coins in your club meter. This game can be played with a 5-coin bet or a 10-coin bet. The game will take 1 coin from your balance and then 4 or 9 coins from your club meter, depending on which bet you’ve chosen. You can’t hold reels in the club game and symbols only pay with three matches. However, you get much bigger wins, especially if you play with a 10-coin bet. Even though you can’t hold reels in this game, you get something even better! When you play the Club Game, you have a chance to trigger the Magic Circle feature game. Remember those blue and red stars? Well, in the Club Game, when you’re playing with either a 5-coin or 10-coin bet and you spin three symbols that have matching star symbols on them, you’ll trigger the Magic Circle feature game! Then, when you’re playing with a 10-coin bet, any colour combination will trigger the feature game – as long as you spin three in one go! This feature is 360 degrees of slot madness! You’ll start in the middle of the circle and the aim is to get to the outmost level, where the biggest wins are. When you trigger this game you’re in for a guaranteed win! On each level of the circle, you’ll either land on a win, an arrow or the ‘stop’. A win will pay you the amount shown and give you another go on the same level. An arrow will move you to the next level. A ‘stop’ will end the feature. If you manage to get to the outer most level, you can be getting wins of 200 coins each go!